Vital safety tips to ensure both you and the horse remain safe when introducing first long lines, saddle and rider. How to introduce the horse to new experiences working through his mind, helping him understand what he is being asked and gaining his confidence. You will learn skills that will help you in the future with horses. How far we progress during either the two day or Four day course depends on the horses we are working with and their level of training. This course is suitable for anyone with a youngster who wants to learn together (you are welcome to bring your youngster at no extra cost) or someone who wants to learn more about horse training in a compassionate way. 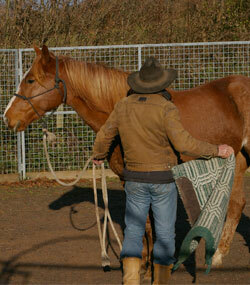 You can either bring your own horse or work with the horses at the John’s yard.